It's bugged. Yes, it is. When you attend the seventh annual UC Davis Biodiversity Museum Day on Saturday, Feb. 17 to see 13 museums or collections, be sure to see It's Bugged: Insects' Role in Design, an exhibit in Cruess Hall that explores the connection between insects and people. Or connects insects and people. 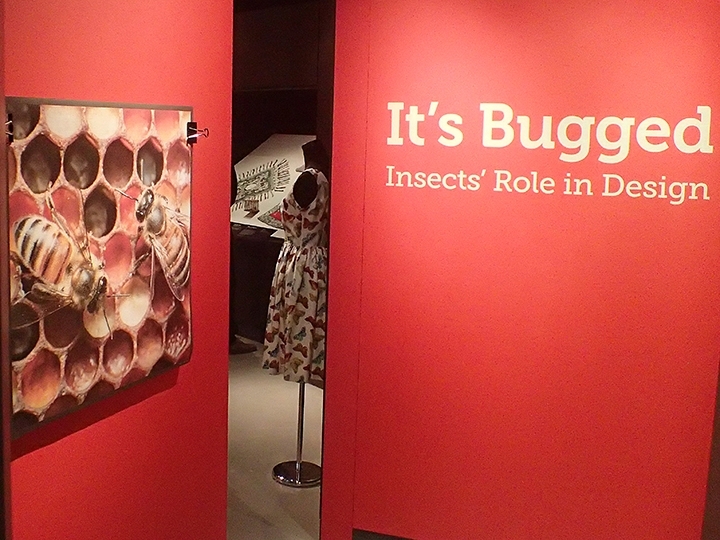 "Bugged" features the work of Department of Design faculty and graduate students, as well as displays from the Bohart Museum of Entomology and insect photos by UC Davis Ph.D alum Alex Wild, now curator of entomology at the University of Texas, Austin. Key attractions include the amazing work of professor emerita Ann Savageau of the Department of Design. 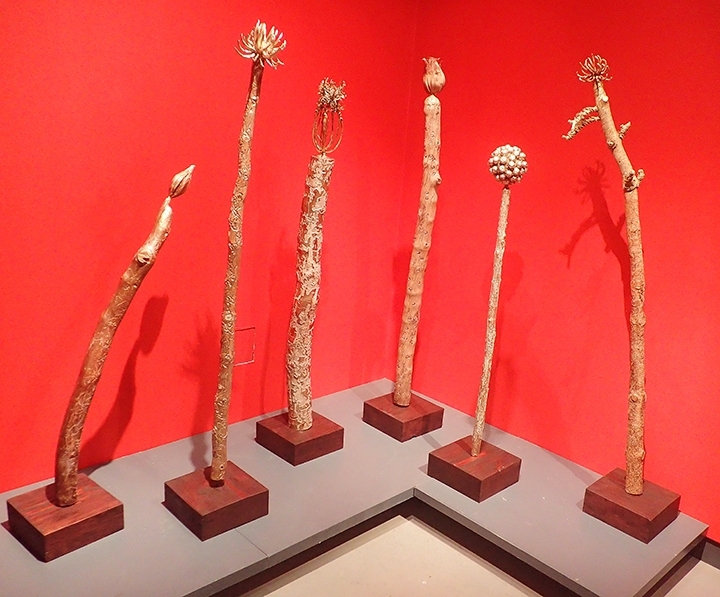 For the exhibition, Savageau created a trilogy of wall pieces made from hornet nest paper, and a set of sculptures made of wood etched into striking patterns by bark beetle larvae. In her talk, Savageau described the bald-faced hornet, Dolichovespula maculata, "as an animal dear to my heart, because I use the paper from its nest to create artworks. This hornet creates large paper nests that have dozens of layers of paper with air pockets in between. Inside are multiple layers of brood combs where the queen lays hundreds of eggs. The larvae are fed chewed insects by the workers." The retired professor and now full-time artist works with the patterns etched by bark beetle larvae under the bark of various trees, including pine and fir. 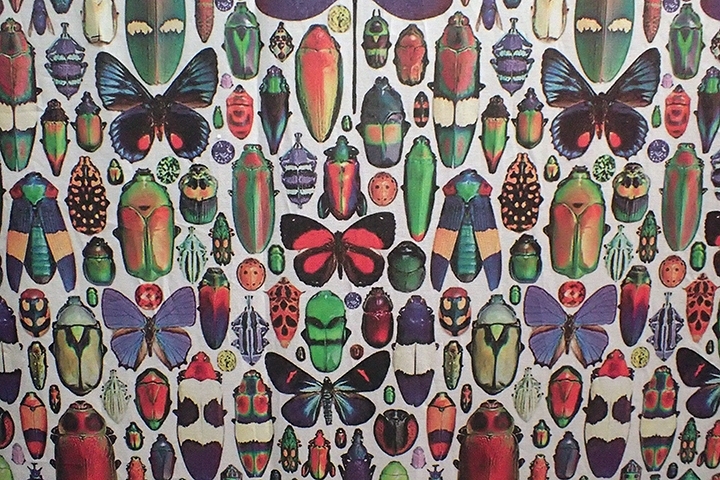 "Each pattern serves a specific function for the beetles and their larvae," she said. For her piece titled "Totems," she applied metallic paints to fill in either the beetle galleries or the top layer of wood. She collected the work of six different bark beetle species, each one with a distinctive pattern. Biodiversity Museum Day is free and open to the public. The following will be open from 9 a.m. to 1 p.m.: Museum of Wildlife and Fish Biology; Bohart Museum of Entomology, Raptor Center, Paleontology Collection, Arboretum and Public Garden; Phaff Yeast Culture Collection; and the Viticulture and Enology Culture Collection. The following will be open from noon to 4 p.m.: Nematode Collection, Botanical Conservatory, Center for Plant Diversity Herbarium, Anthropology Museum, Häagen-Dazs Honey Bee Haven, and the Design Museum. You can download maps at http://biodiversitymuseumday.ucdavis.edu. Capsule information is here. 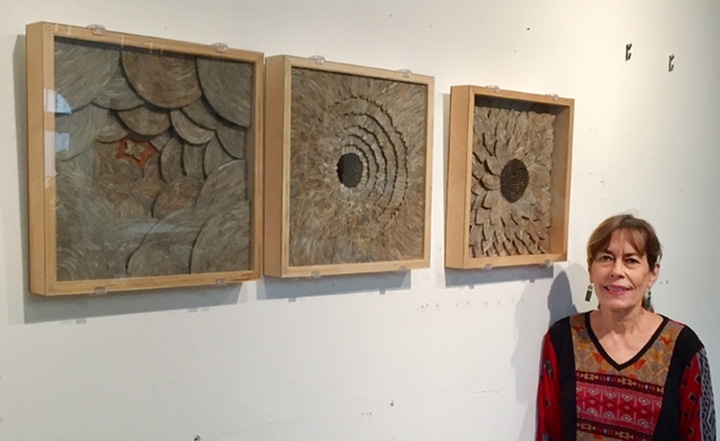 Professor emerita Ann Savageau of the Department of Design with her trilogy of wall pieces made from hornet nest paper. UC Davis Biodiversity Museum Day: Bugged! 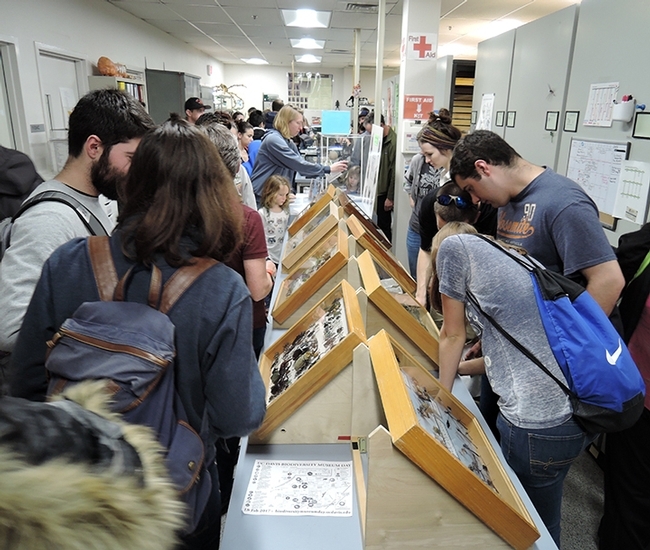 In some respects, you could say the seventh annual UC Davis Biodiversity Museum Day on Saturday, Feb. 17 will be bugged! Lots of insects and other arthropods will be among the scores of attractions. The campuswide event, set from 9 a.m. to 4 p.m. and free and open to the public, will showcase 13 museums or collections, ranging from hawks to honey bees, and from dinosaur bones to dragonfly specimens. 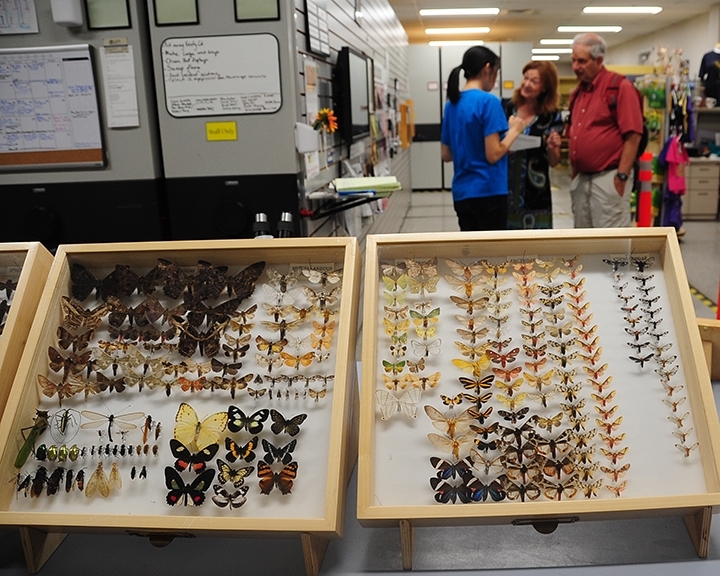 It's all about exploring the diversity of life, says committee chair Tabatha Yang, education and outreach coordinator for the Bohart Museum of Entomology. You'll see "bugs" at four sites: the Bohart Museum of Entomology, Häagen-Dazs Honey Bee Haven, the Nematode Collection, and at the Design Museum's special exhibition, It's Bugged: Insects' Role in Design. The Bohart Museum of Entomology, open from 9 a.m. to 1 p.m. on Feb. 17, is the home of a global collection of nearly 8 million insect specimens. Highlights will include the 500,000-specimen butterfly/moth collection, curated by entomologist Jeff Smith; display of praying mantises, including orchid mantises, by UC Davis entomology student Lohit Garikipati; and an insect collection display by Smith and fellow Bohart Museum associates Fran Keller and Dave Wyatt from their latest expedition to Belize. "You'll be able to see the tremendous diversity of butterflies, moths and mantids, and talk to the scientists who have just returned from there," said Tabatha Yang, education and outreach coordinator. "There will be orchids and orchid bees connecting the Bohart Museum's work with plant biology and science." 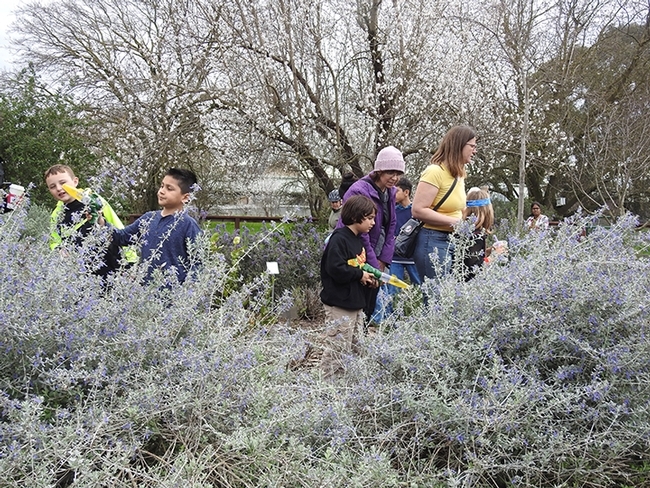 Häagen-Dazs Honey Bee Haven, a half-acre bee demonstration garden next to the Harry H. Laidlaw Jr. Honey Bee Research Facility, Bee Biology Road, will be open from noon to 4 p.m. Activities include catch-and-release bee viewing and making "Feed the Bees" seed cookies. The haven was installed in the fall of 2009. A six-foot-long bee sculpture, Miss Beehaven, by artist Donna Billick, co-founder and co-director of the UC Davis Art/Science Fusion Program, anchors the haven. Other art, coordinated by entomology professor Diana Ullman, co-founder and director of the Art/Science Fusion Program, and Billick, also graces the haven. Guests will see bee condos occupied by leafcutter bees and mason bees. Robbin Thorp, distinguished emeritus professor of entomology, has recorded more than 80 different species of bees in the garden. Coordinator: Christine Casey, academic program management officer. The Design Museum will be open from noon to 4 p.m. in Room 124 of Cruess Hall. Professor Timothy McNeil and curator Adrienne McGraw will staff the exhibit, It's Bugged: Insects' Role in Design, which explores the connections between people and insects. This is a special opening just for Biodiversity Museum Day. (The exhibit opened Jan. 8 and continues through April 22; regular hours are weekdays from noon to 4 p.m. and Sundays from 2 to 4 p.m.) "It's Bugged" includes art from faculty and graduate students. It will include hornet nest paper art and beetle gallery sculptures, both the work of Ann Savageau, professor emerita, UC Davis Department of Design; insect-themed clothing; insect specimens from the Bohart Museum of Entomology and insect photos from UC Davis alumnus Alex Wild, curator of entomology at the University of Texas, Austin. 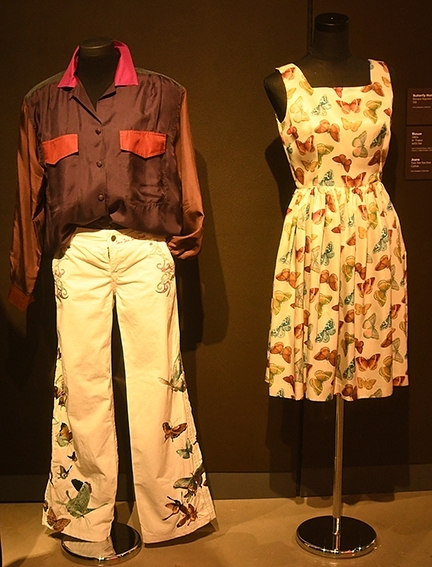 Coordinators: Timothy McNeil, professor, and Adrienne McGraw, exhibition curator. 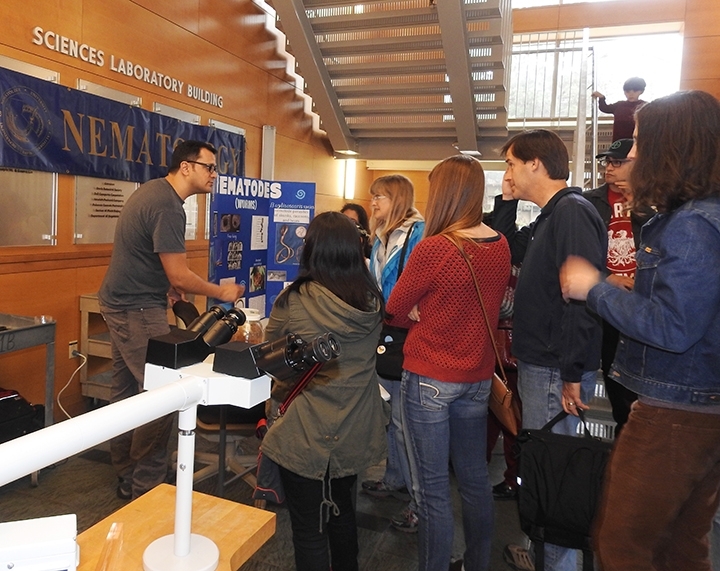 The Nematode Collection will be open from noon to 4 p.m. in the Science Laboratory Building, central campus (off Kleiber Hall Drive). 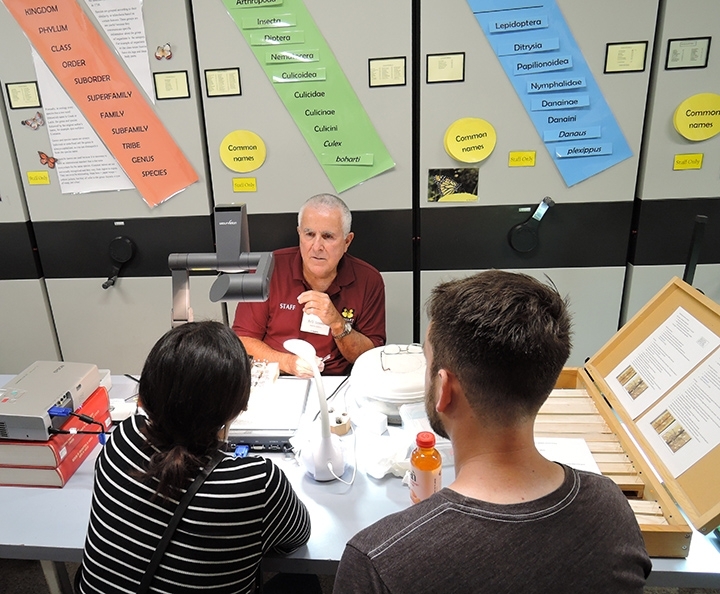 Visitors can expect to see live and preserved nematode specimens. Highlights include the huge jars of whale intestinal worms. Nematodes, also called worms, are elongated cylindrical worms parasitic in animals or plants or free-living in soil or water. They exist in almost every known environment. The many different species eat everything from bacteria and fungi to plant and animal tissue. Coordinator: Corwin Parker, nematology doctoral student. For further information on the Biodiversity Day, access the UC Davis Biodiversity Museum Day website for maps and more information, including social media links, Facebook and Twitter, @BioDivDay. There's also capsule information on the Department of Entomology and Nematology website. Last year's Biodiversity Museum Day drew some 4000 visitors to campus. This year? Many more are expected. Oh, that praying mantis! Oh, that jumping spider! 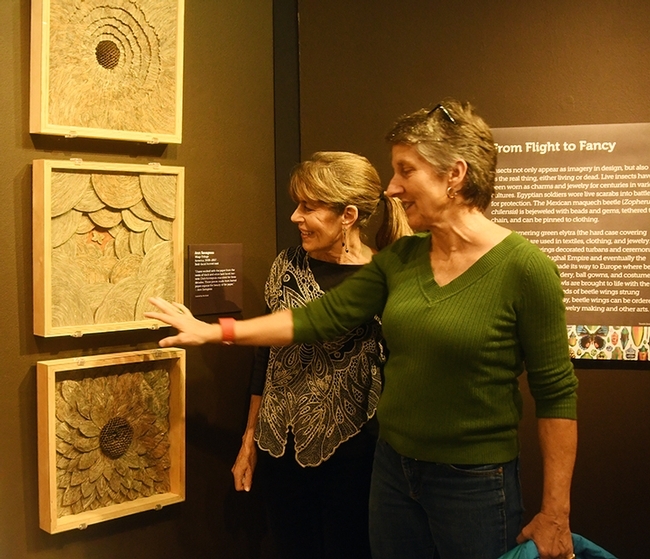 When you attend the UC Davis Bohart Museum of Entomology's open house on Sunday, Jan. 21, featuring insect art, you will find art so intricate and so breathtaking that you may change your career path! The family friendly event, free and open to the public, takes place from 1 to 4 p.m. in Room 1124 of the Academic Surge Building. Two of the talented artists showing their work will be Charlotte Herbert, who is seeking her doctorate in entomology from UC Davis, and Ivana Li, a UC Davis biology lab manager who received her bachelor's degree in entomology from UC Davis in 2013. 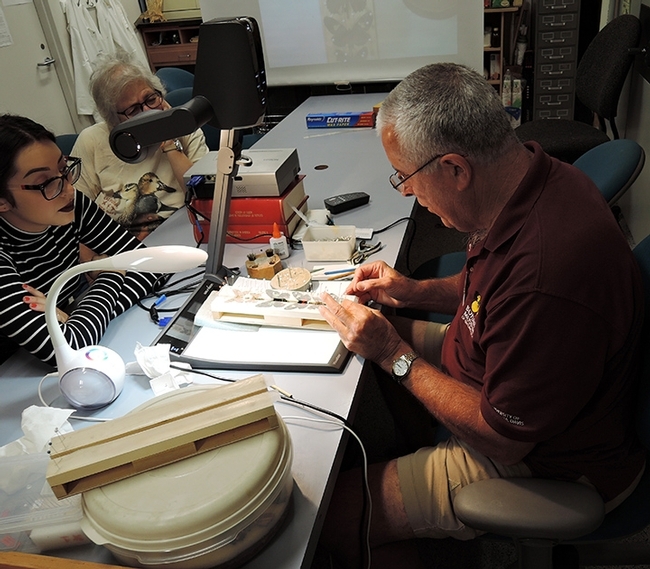 Herbert studies Asilidae (assassin fly) evolution with major professor Lynn Kimsey, director of the Bohart Museum and professor of entomology. "I hope to someday make my own scientific illustrations for taxonomic revisions," Herbert says. "My dream is to be a curator of an entomology museum." Herbert started drawing and painting in 2015 and "have loved it ever since." She now helps teach Entomology 001, and entomology and art fusion class. 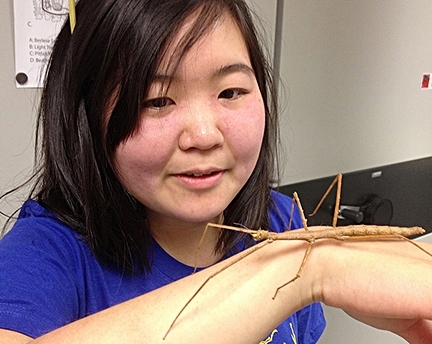 Li, a past president of the UC Davis Entomology Club and a recipient of the UC Davis Department of Entomology's 2012 Outstanding Undergraduate Award, recalls that her fascination with insects began in early childhood but she didn't know the meaning of “entomologist” until her second-grade encounter with Chester. Chester is the main character of George Selden's Newbery-award winning book, A Cricket in Times Square. Visitors are also invited to pick up a colored pencil and paper and sketch an insect, said Yang. 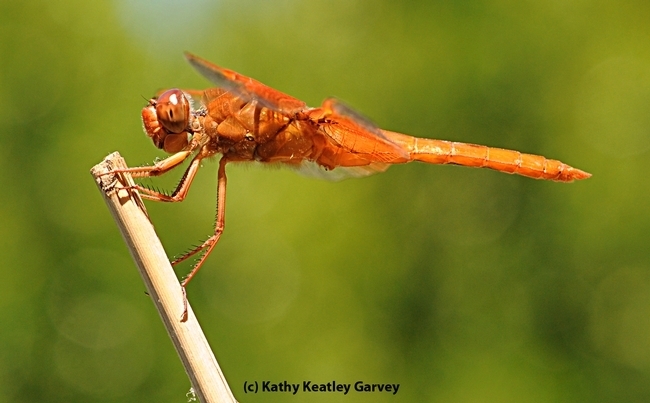 For those not artistically inclined, images of dragonflies from Dragonflies of North America: A Color and Learn Book with Activities by dragonfly expert/author Kathy Biggs and illustrator Tim Manolis, will be available for people of all ages to color. 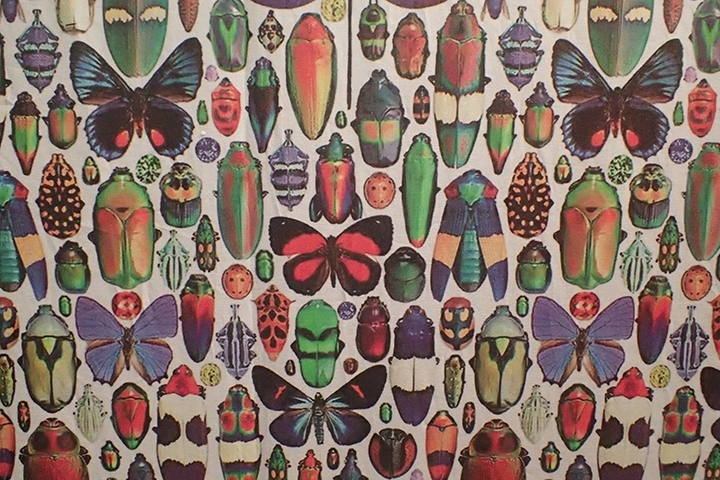 In connection with Bohart open house, campus visitors can tour the Design Museum exhibit, It's Bugged: Insects' Role in Design, in 124 Cruess Hall from 2 to 4 p.m. The exhibit, which runs through April 22, includes art from faculty and students affiliated with the UC Davis Department of Design, and specimens from the Bohart Museum, as well as images by UC Davis alumnus and noted insect photographer Alex Wild, curator of entomology at the University of Texas, Austin. Wild received his doctorate in entomology from UC Davis in 2005, studying with major professor Phil Ward. 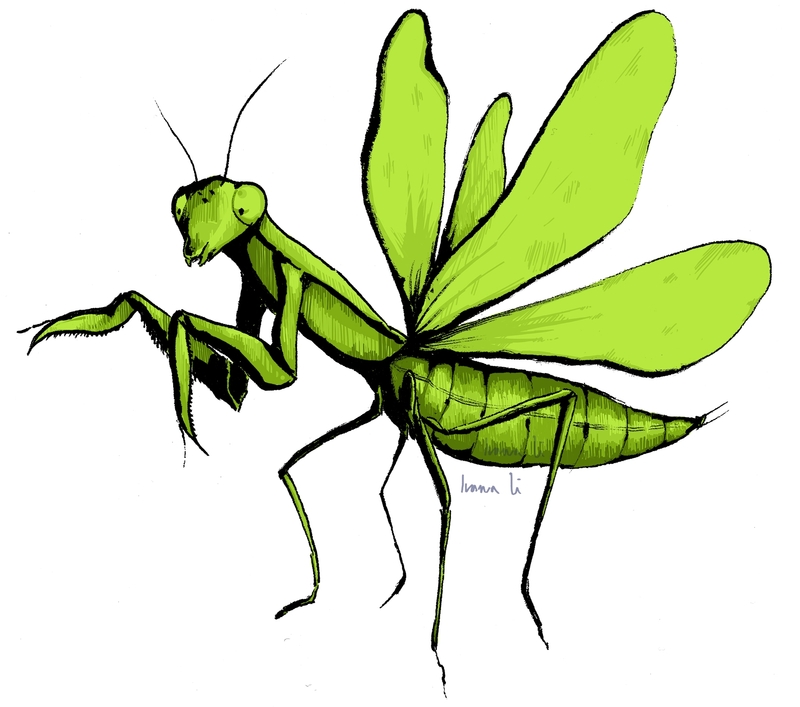 This stunning praying mantis illustration is the work of Ivana Li, UC Davis entomologist and artist. 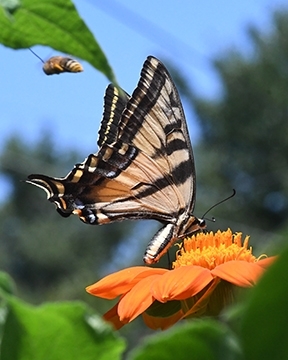 It will be among the art displayed at the Bohart Museum of Entomology's open house on Jan. 21. 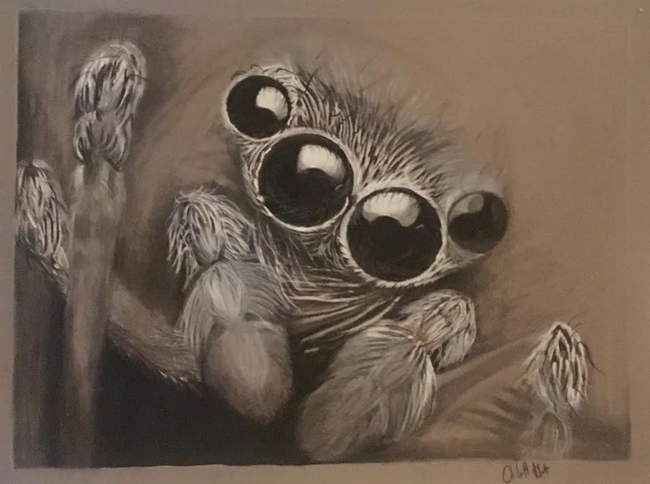 This breathtaking illustration of a jumping spider, in black and white charcoal, is the work of entomologist/artist Charlotte Herbert. She is seeking her doctorate in entomology from UC Davis. 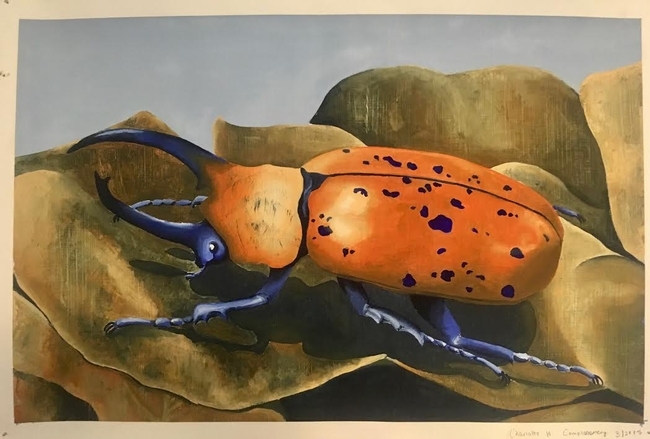 This is a Hercules beetle, Dynastes hercules, that entomologist/artist Charlotte Herbert created in oil paint (a complementary study of orange and blue, where she used only used orange, blue, black, and white to paint it). It will be displayed Jan. 21 at the Bohart Museum open house. Entomologist Jeff Smith, who curates the butterfly and moth collection at the Bohart Museum of Entomology, UC Davis, is in butterfly heaven. And even more so now--he just returned from a collecting trip to Belize with his colleagues and brought back some 700 to 800 Lepidoptera specimens. Smith will be among those presenting at the Bohart Museum's open house on "Bug-Art@The Bohart" from 1 to 4 p.m., Sunday, Jan. 21. 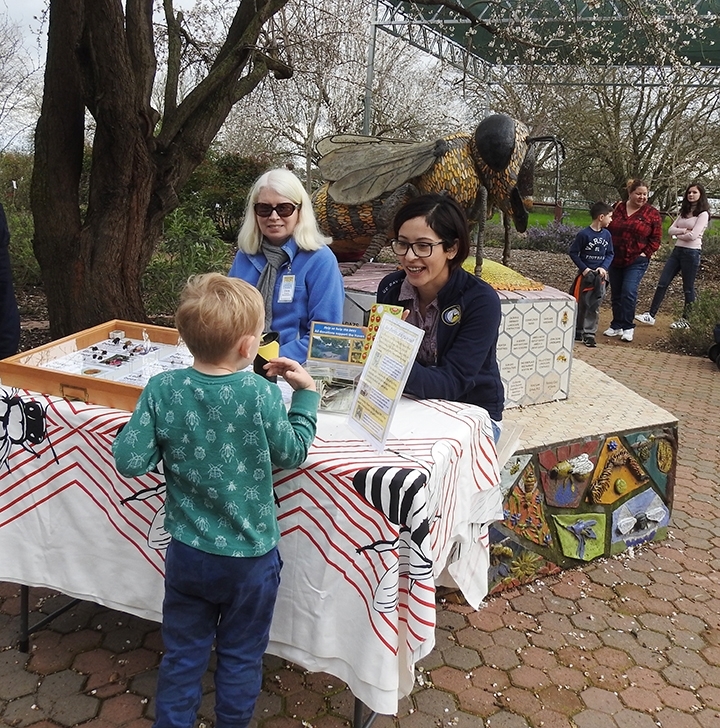 The event, free and open to the public, will include art displays, sketching demonstrations; coloring of dragonfly images, and other insect-art interests, including an insect tattoo contest and an insect-themed attire contest. How large is the Bohart's Lepidoptera collection? It has now reached about half a million, estimates Smith, a longtime volunteer honored with a UC Davis College of Agricultural and Environmental Sciences' "Friend of the College" award. "I believe I spread over 4,000 specimens from an August 2017 trip to Belize, and brought back maybe 700-800 more from this recent Belize trip, so the numbers continue to grow." Specifically, what's on tap for the Bohart open house? 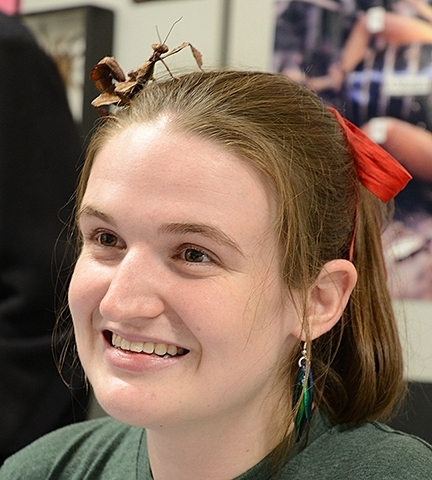 UC Davis entomology major and artist Karissa Merritt will demonstrate how to sketch insects. Other art featured will be that of the late Mary Foley Bensen, a former Smithsonian Institution scientific illustrator who moved to Davis and worked for UC Davis entomology faculty; Lynn Siri Kimsey, director of the Bohart Museum and professor of entomology; and Charlotte Herbert, Ph.D. student; and UC Davis entomology alumni/artists Ivana Li and Nicole Tam. An exhibit of "insect wedding photography" images by Bohart associates Greg Kareofelas and Kathy Keatley Garvey is also planned. Visitors will be invited to sketch insects. If you're not artistically inclined, you can color the images of dragonflies from a coloring book by dragonfly expert/author Kathy Claypole Biggs and illustrator Tim Manolis. The open house will definitely be interactive! Attendees are invited to wear insect-themed attire and jewelry. A contest will take place at 3 p.m. for the best insect-themed outfit, and for the best insect-themed tattoo (tattoo must be in a family friendly site). 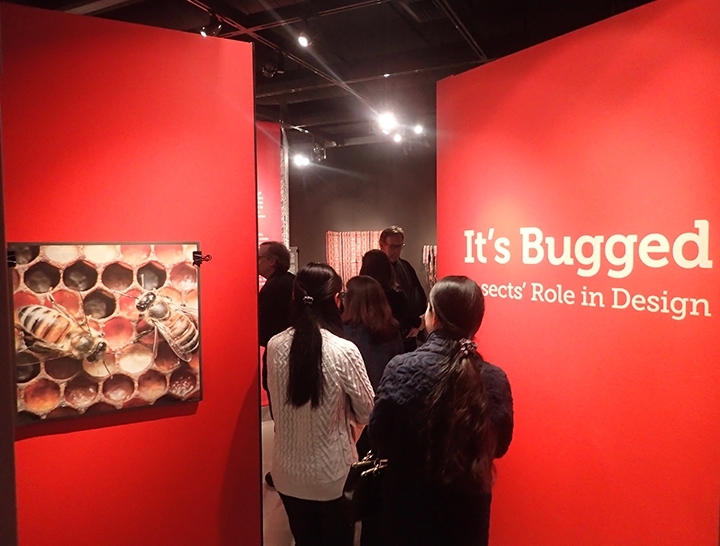 Also on Jan. 21, insect/art enthusiasts are invited to view the unique exhibition, It's Bugged: Insects' Role in Design from 2 to 4 p.m. in Room 124 of Cruess Hall. The exhibit, which continues through April 22 (the event is free and open on weekdays from noon to 4 p.m. and on Sundays from 2 to 4 p.m.) features the work of faculty and graduate students from the Department of Design; specimens from the Bohart Museum; and insect photography by UC Davis alumnus Alex Wild, curator of entomology, University of Texas, Austin. 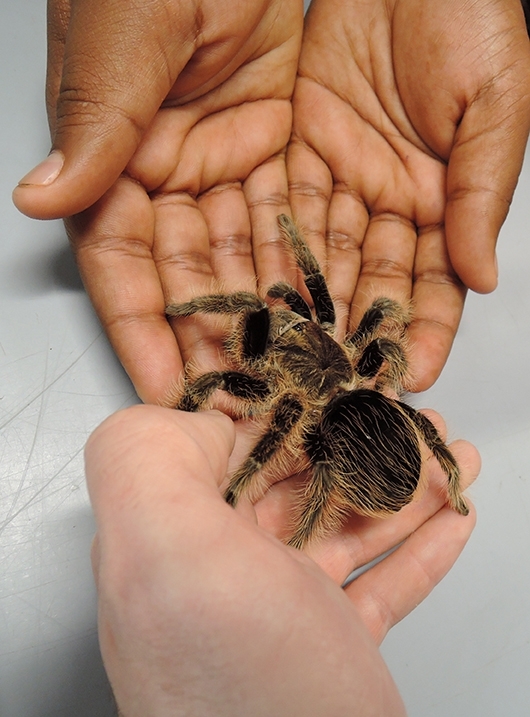 World-renowned for its global collection of nearly eight million specimens, the Bohart Museum also maintains a live “petting zoo,” featuring walking sticks, Madagascar hissing cockroaches, walking sticks, praying mantids, and tarantulas. A gift shop, open year around, offers T-shirts, sweatshirts, books, jewelry, posters, insect-collecting equipment and insect-themed candy. The Bohart's regular hours are from 9 a.m. to noon and 1 to 5 p.m. Mondays through Thursdays. The museum is closed to the public on Fridays, Saturdays and Sundays and on major holidays. Admission is free. For more information, contact the bmuseum@ucdavis.edu or access the website or Facebook page.